I’ve been thinking of this punch for a few days, ever since I came home to my parents house for the holidays. Every year when I come home at Christmas, I look forward to an abundance of Meyer lemons, anticipating the sweet and delicate floral fragrance of the fruit for weeks ahead of time. My parents live in an older neighborhood in the Central Valley, and decades ago, when these houses were being built, it was fashionable to plant citrus trees in the yard, symbols of that optimistic California cheer. Over the years and countless winter walks, we’ve come to know which houses have which trees, where you can find the tiny fragrant grapefruit, the nubby-skinned Eureka lemons, the endless navel oranges, or the golden and delicate Meyers. We duck into alleys, surreptitiously plucking fruit from the branches that hang over the fences, or pick bushels of tangerines from the neighbor’s tree, per a verbal agreement made some twenty years ago. This year my parents’ 40-year-old Meyer tree has finally exhausted itself, producing only three lemons on it’s twisted and gnarled branches. So we walked the neighborhood, hoping to find a tree where we could pick a handful that would otherwise be neglected, falling into the sidewalk or where there was simply too much fruit for one household to manage. But things are changing in this neighborhood, and citrus has fallen out of favor, and as new people buy and fix up the houses, the trees become more and more difficult to spot. After two walks with my parents we hadn’t found any Meyers we could comfortably snag. Yesterday, however, my parents went for a long walk without me, and returned home with pink cheeks and bulging pockets full of the delicate fruit, my mom excited and talkative about their adventuresome discovery. So! The punch I’d been dreaming of can finally come to fruition, thanks to mom and dad and and their two-hour strolls and squirrel-like citrus-hoarding ways. 8 oz Winter Solstice tea (this is my absolute favorite black tea, only available seasonally), prepared according to the instructions and cooled. This tea contains citrus and vanilla notes, and its delicate fragrance is a great match for the light and subtle sweet-smelling Meyers. 2 oz Vanilla simple syrup (1 cup sugar, 1 cup water, contents of 1 vanilla bean scraped out and the whole bean dropped in, simmered until the sugar dissolves. Strain and cool). The fragrant vanilla pairs nicely with the delicate perfume of the Meyers, and also helps to emphasize the vanilla notes already present in the tea. Yum! To make the lemonade, combine all ingredients and stir. 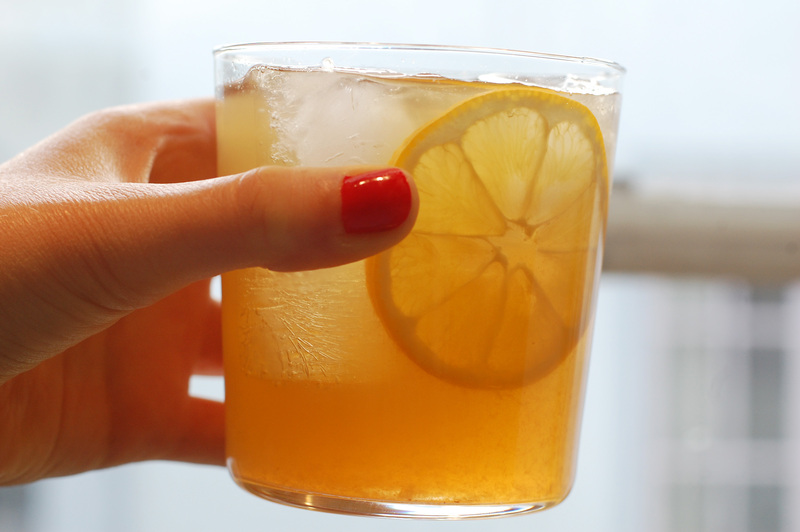 To make the cocktail, combine the bourbon, tea, and lemonade in a pitcher with ice and stir. Pour over ice and garnish with a Meyer lemon wheel. And! 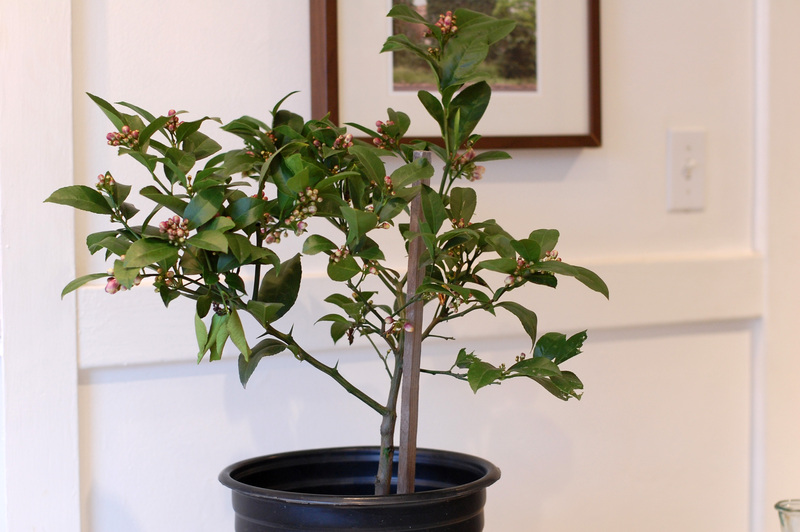 I somehow managed to convince my parents to gift me with my very own dwarf Meyer lemon tree, so that from now on I can grow my own! Isn’t she beautiful? I can’t wait to pick my own Meyers for years to come.